Summon: +1/+1 for each other friendly creature. 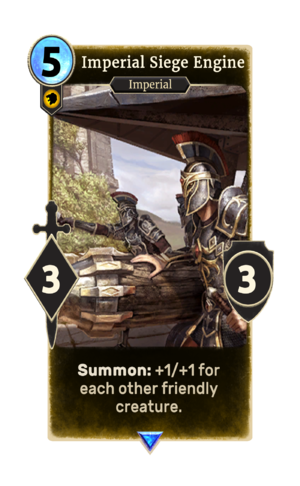 Imperial Siege Engine is a rare Willpower creature card. It is part of the Core Set. In addition to the card's availability in the Core Set, two copies are included in the Imperial Might deck. This card's summon ability applies the Battle Stations card effect. This page was last modified on 24 September 2018, at 22:54.